One of our loyal readers just tied the knot and sent us some of her fabulous engagement and wedding photos, taken by J Patrick Dean. 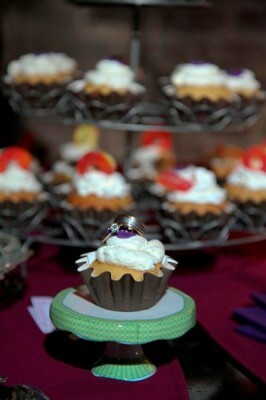 I thought these were lovely, and a great way to incorporate cupcakes into engagement and wedding photography. The bride even made all of the cupcakes for the engagement shoot and wedding herself. Talk about dedication! Congratulations to the newlyweds! Thank you for sharing these creative pictures with us! 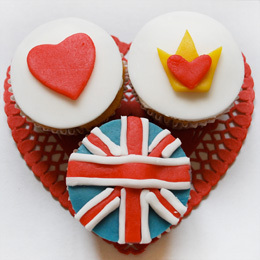 How will you be celebrating April 29th for the royal marriage of Will and Kate? If you are not sure yet then I may have just the thing for you. Fun, easy and kid friendly! Is it too early to start thinking about summer cupcakes? I mean Spring is only just starting to bloom, but if you are planning a wedding then you probably will be well on the way to deciding! So today I thought I would bring a bit of a summer wedding collective! But if you are not getting married, don’t despair, each of these also make great general summer cupcakes, so book mark them for when the weather warms up! Love this cool summer color palette, bright blues and vivid sea green, with lots of wedding white. Simply perfect cupcakes from Bella Cupcakes. Also I love the use of the sea urchin! After throwing our first ever cupcake themed party a month ago for my daughter’s 7th Birthday I am a massive fan. The girls all had a fantastic time decorating the cupcakes, in the tea party like setting I had created. I only wish I had known about these first! 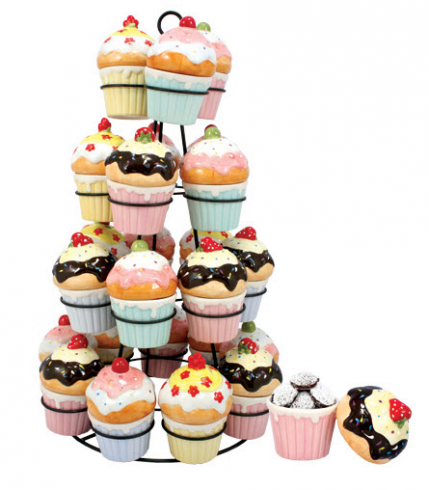 This is a cupcake centerpiece , which (don’t be fooled by the picture) is quite big standing at about 20 inches tall, each cupcake being 5 inches tall. But the best thing about these is that they offer you unlimited ideas for future cupcake parties, or tea parties. Of course, you don’t need to get the full stand with all 24 cupcakes, you can also buy the cupcake jars filled with cupcake cookies individually. Best of all, is I hear the cookies are amazing! I could really go the triple chocolate cookie jar right now! If you are looking for these, you’ll find them at Diva Entertains! 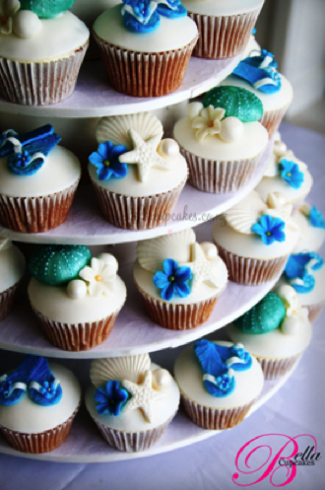 This is a way to have your cupcakes and your cake too at your wedding. 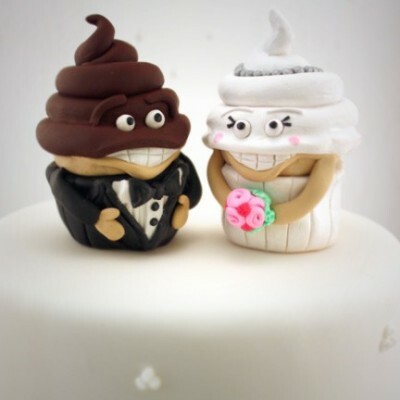 I found this very cute and comical Cupcake Wedding Cake Topper at Bitter Sweetz’ Etsy Shop. If you do not like the colors that you see here you can request just about any color combination and the artist will be willing to change anything else that you would like them to. The vintage wedding is quite popular at the moment, and why wouldn’t it be, with shows like Mad Men displaying how wonderful the female figure can look in those classic 50s style dresses, but if you choose to go this way, you may wonder how you can merge your vintage theme with your love for the modern cupcake. Well Pretty Witty Cakes shows us just how this can be achieved! 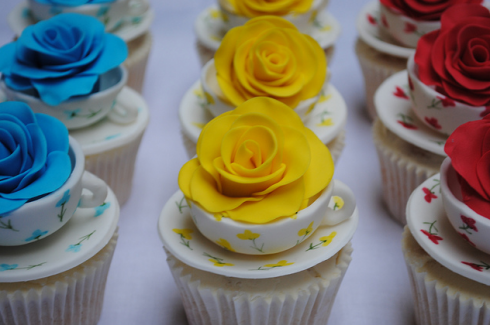 Suzi has created gorgeous china tea cup cupcakes filled with different colored roses! Apparently it was quite a fiddly job to complete, but it looks sensational! Grippy socks for your party? Got a no shoes policy at your home? or just want to provide a great take home gift for your girlfriends? There is something so fun about these socks! Okay if you don’t know what I am talking about, it is Grippy Socks, you know those great winter socks that you can safely wear around the house (that is you’ll stay upright). But these are even better because they contain cupcakes on them and they can be personalised. Instead of bird seed or a plastic take home gift from your wedding, you could provide something really useful and super fun in these socks! 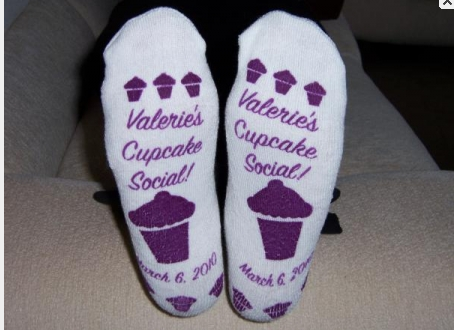 Or generate your support for your cupcake cause or organisation by creating your own branded cupcake home footwear. I am not sure though that they can replace shoes just yet in your bakery, but hey! You can get these socks from ATC Sponsor Diva Entertains and best of all you can write text in both the top part of the sole and the bottom part as shown above. Don’t forget that you can also choose the colors of both the socks and the text!